Journal Principalement Consecre a l'etude des Facultes de l'Ame et a la Demonstration de son Immortalite par l'examen Raisonne des Divers Genres de Manifestations Medianimiques et de Phenomenes Psychiques tels que le Somnambulisme, l'Extase, la Vue a Distance, etc. / Principalement Consacre a la Demonstration de son Immortalite et a la Remise en Lumiere des Verites de la Religion Universelle (Philosophie et Exegese religieuses, manifestation des Esprits, Magnetisme, Thaumaturgie, Sciences Occultes, Propheties, Theosopie, Cosmogonie, Ontologie, Pneumatologie, Psychologie, Philosophie de l'Histoire, etc., etc.). Paris, France. Language: French. Publisher: Publ. Bureau Provisoire. Editor: Z.J. Pierart. This was the non-Kardecist (and non-reincarnationist) competitor of Allan Kardec's Revue Spirite. As Fodor notes, "Kardec won and Pierart, after years of bitter controversy, retired into the country." In fact, Pierart (1810-1878) went on to found the Councile de la Libre Pensee (suppressed in 1873) and the Benedictin de Saint-Maur (which advocated a freethought spiritualist monastary along Essene lines that Pierart hoped to found). He was a playwright, antiquarian, and professor at the College of Maubeuse, and had begun his publishing career as the secretary of Baron Du Potet and then become editor of his Journal du Magnetisme until he was fired in the internecine conflicts between spiritualists and magnetizers. The journal is far more encompassing and entertaining than Kardec's contemporary Revue Spirite, featuring "M. Home et le Miroir Magique," the exploits of Baron L. de Guldenstubbe (who was one of the patrons of the journal and who thought spirits could write on their own rather than through mediums and accordingly left his visiting card, awaiting responses, on statues of the famous dead he wanted to contact). The journal also regularly featured articles on "Le Merveilleux en Orient et en Europe" on the exploits of Abbe Huc, Gobineau, the "Nosayris," and Leon de Laborde's scrying in Cairo with a young Arab boy, and in 1865 carried an opera ("Swedenborg") received through the mediumship of Dr. C. Maldigny. 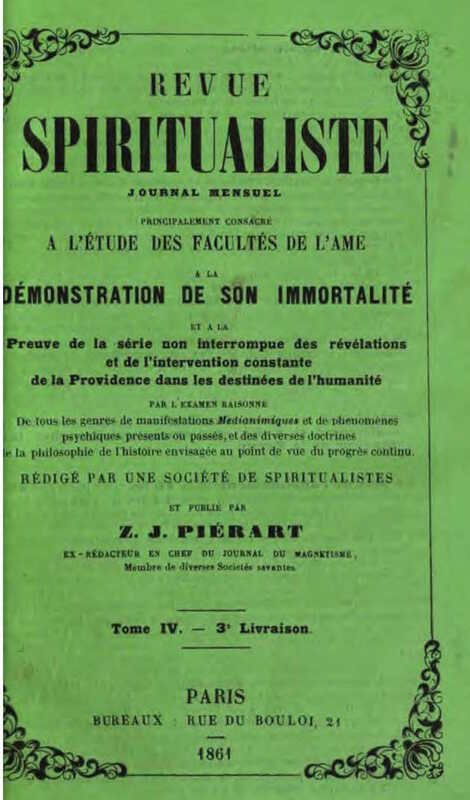 Pierart has continued to be of some interest today because of articles he wrote in the journal explaining vampirism as the consequence of the failure of the "astral body" to separate itself completely from the physical body at death. In the early 1860s, Pierart shared his apartments with the visiting American medium J.R.M. Squire, one of the principals in the Banner of Light, who entertained Paris with demonstrations of American mediumship. Crabtree 795. NYPL; Cambridge University; Freiburg Inst Grenzgeb Psychol; University of Nebraska, Omaha.